The term black belt has become widely known as a way to describe an expert in martial arts where a practitioner's level is often marked by the colour of the belt. 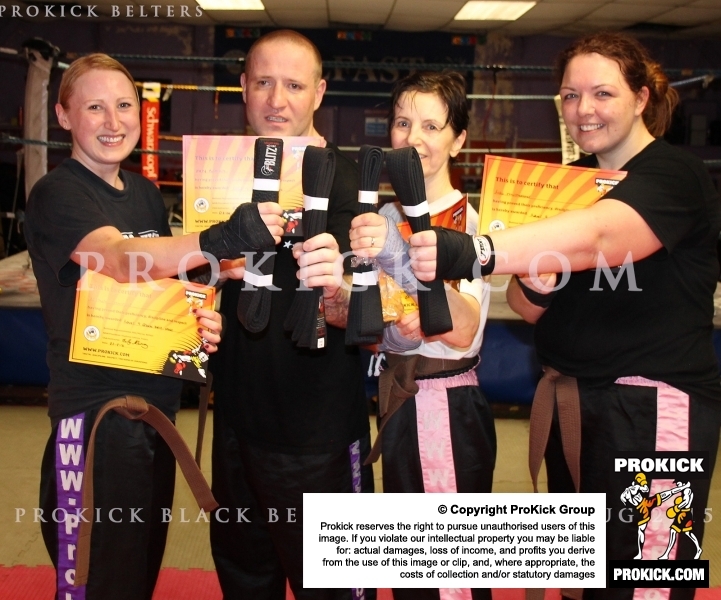 The black belt is commonly the highest belt colour used and denotes a high degree of competence, and often associated with a teaching grade though frequently not the highest grade or the "expert" of public perception. The true Fab Four. "Although they have been training in the art of kickboxing at the ProKick gym for ten years, they have upped their training over the last 10 days, every day and night, hours & hours at a time for the last week and a half training. Covering all aspects of the Martial arts, from the ProKick kickboxing syllabus which includes, self defence, striking, ground work, weapon defences, multi defence situations, circle training and contact sparring - " said Murray, "It hasn't been an easy task. But I know that all my guys really feel they have earned the acolade of black belt." Murray added "In the history of ProKick, since 1991 we have only had a handful of black belts, for the simple reason... it's a long drawn out process, unlike some organisations that is more geared toward a monetary factor. Whereas ProKick acknowledge the time spent with students and offers this grade and the extended training and all the preparation free of charge. The New Fab Four, now join the ranks of ProKick elite members. Gary Fullerton a former WKN European kickboxing champion with over 30 fights under his belt. Lisa Mulholland who has battled through illness and stuck at it, taking her over 20 years to succeed, Lisa, also gives her time to help as an assistant instructor in the kids classes. Nicola Crawford a 12 year-long member who has missed very little time or any ProKick events over all those years who is consistent in all aspects of the sport at ProKick. And Granny Goody herself who has spent over 10 years perfecting the knowledge to achieve the ultimate goal for most martial artists…A BLACK BELT at the young age of 58. I'd like to personally congratulate each and every one of them for their hard work, dedication and loyalty which is becoming even more rare in today's martial art world. The grading was assisted by the first ProKick Black belt Gail Hagen who sat in on today's proceedings. Well done also to a new pair of ProKick junior Black belters Bailey Allen age 11 and Grace Goody age 13 on this fabulous achievement. There was one casualty of war, Paul Orchin. Paul was hurt during his preparation for his Black Belt grading and had to withdraw.